Cinora : Fine Bridal Jewelry - A signature B2C Jewels Collection, the Cinora line of fine bridal jewelry consists of unique designs that are individually tailored to create a one-of-a-kind heirloom, a piece of art that mirrors what is uniquely yours. Every piece of jewelry is carefully hand crafted to your exact requirements by our expert artisans in our New York office. 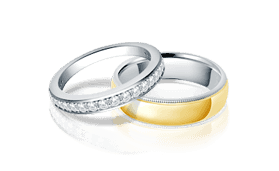 Your Journey to Cinora Jewelry - We start by choosing the perfect center stone for your jewelry. 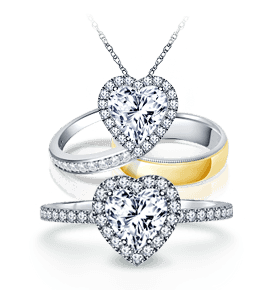 Every piece of Cinora Jewelry is designed to complement and showcase the diamond perfectly. The specifications of the accent diamonds on your ring, necklace or earrings will be balanced with ideal sizes and quality that perfectly match your center stone. Our designers use CAD (Computer-Aided Design) technology to create a custom design. The best part of this journey is that you will be involved throughout the process until your Cinora Jewelry piece is perfected. Explore the unique and extraordinary Cinora engagement ring collection, encapsulating classic elegance along with vivid designs. 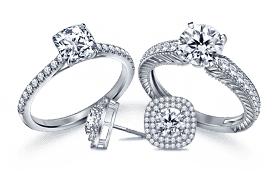 Discover the Cinora line of breathtaking Diamond bands illuminating timeless grace and sophisticated styles. Browse the Cinora collection of fancy colored diamond rings, where opulent design meets exceptional color. Diamond necklaces from the Cinora collection feature a beautiful interplay of sparkle from diamonds and remarkable design.